"Hot-and-humid metros in the Southeast can birth more summer thunderstorms than rural areas," Becky Oskin reports for LiveScience. "Researchers marked the location of every thunderstorm born in northern Georgia and northeastern Alabama during a 17-year period. There were nearly 26,000 thunderstorms detected between 1997 and 2013. . . . 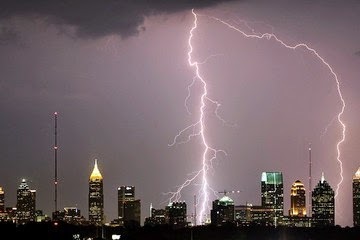 The was a 5 percent greater chance that thunderstorms would pop up over Atlanta compared with the city's surrounding rural areas, the researchers found." "Per year, that amounts to two or three more thunderstorms of the pop-up variety," which are harder to forecast, said Northern Illinois University graduate student Alex Haberlie, lead author of the study report. A co-author, NIU meteorology professor Walker Ashley, said "This study presents the first evidence that urban areas birth or initiate thunderstorms more often than the surrounding rural areas on a climatological timescale." LiveScience reports, "The storm risk was greatest for urban and suburban Atlanta in the late afternoon and early evening during July and August, according to the study, published Jan. 7 in the Quarterly Journal of the Royal Meteorological Society. "The findings would likely hold up in similar hot-and-humid Southern cities, such as Nashville, Tennessee, and Birmingham, Alabama, Haberlie said. "Thunderstorm births were significantly higher on weekdays than on weekend days," Oskin writes. "This suggests higher pollution levels within the city may play a role. . . . The concrete jungle produces heat, often making cities 2 to 5 degrees Fahrenheit hotter than the surrounding countryside. This extra heat means low pressure can form atop urban areas, with higher pressure in rural areas, sparking convection that can trigger thunderstorms." Also, "Tall buildings may enhance the upward convection that leads to thunderstorms." 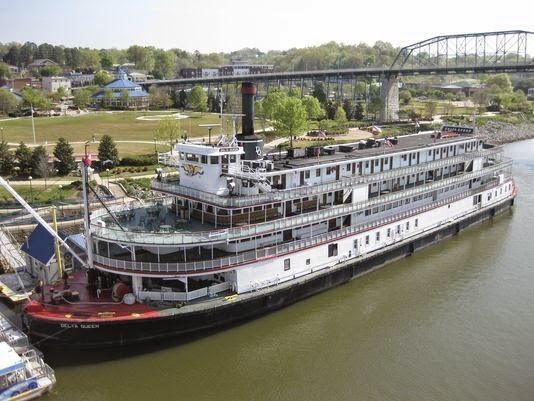 The Republican takeover of the Senate appears to have boosted chances that the historic Delta Queen steamboat will resume cruises on the Mississippi and Ohio rivers, making many rural stops. An investment group led by Louisiana businessman Cornel Martin agreed Tuesday to buy the paddlewheeler for an undisclosed sum, and Martin said he plans to spent $7 million on "extensive mechanical and hotel renovations on the vessel and return it to service in 2016," writes Bowdeya Tweh of The Cincinnati Enquirer. Last year, two Democratic senators blocked a bipartisan move to exempt the boat from "a 1966 safety law that bars wooden vessels such as the 88-room Delta Queen from carrying 50 or more passengers on overnight journeys," Tweh reports. "Critics call the boat a potential fire trap that could put passengers at risk and tarnish the entire paddle-wheel cruise industry." But now that the Senate is in Republican hands, and led by Kentucky Sen. Mitch McConnell of Louisville, chances would seem to be better, as Martin appears to have concluded. "Weak prices for energy and farm produce, sagging exports, declining farm equipment sales and lower prices for farmland combined to push the rural Midwestern economy into decline this month, according to a Creighton University survey," taken among bankers in 10 states, Steve Jordon reports for the Omaha World-Herald. "The survey results have hovered near the no-gain, no-loss level of 50, on a 100-point scale, in recent months, slipping to 46.4 for the latest Rural Mainstreet Index, with an outlook index for the coming six months of 41.5," Jordon writes. Farmland prices declined for the 15th month in a row, at a rate of 6 percent to 8 percent a year. Creighton takes the survey in Colorado, Illinois, Iowa, Kansas, Minnesota, Missouri, Nebraska, North Dakota, South Dakota and Wyoming. 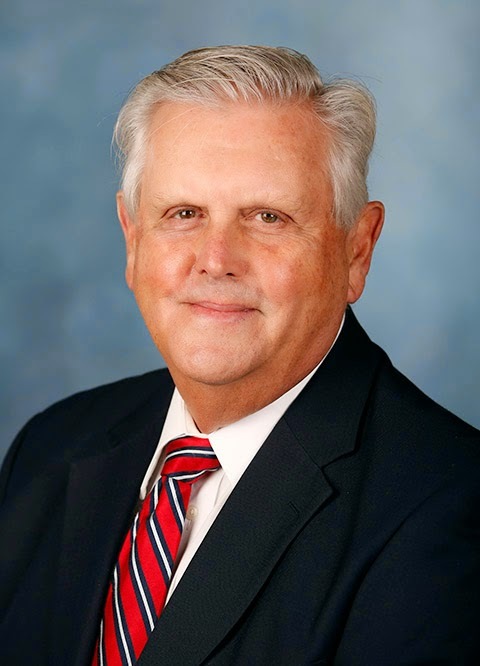 The urbanization of America and the loss of population in rural areas is causing problems for schools in those areas, some of which are caught up in a downward spiral due to job losses, Kentucky Education Commissioner Terry Holliday says on his blog. "The loss of student population means the loss of federal, state and local revenue for our schools," Holliday writes. "The loss of revenue means fewer teachers and fewer course offerings for students. The loss of revenue means less funding for teacher pay increases which means the gap between teacher availability in rural settings and urban settings will grow. This is especially evident when rural settings try to hire math, science, and special education teachers. The loss of revenue means less funding to build and maintain school facilities. "Our normal solution in the past has been to push for more education. However, this creates a conundrum. If we educate more students to higher levels, then those with more education will seek better paying jobs and when no jobs are available, the talent will leave for areas that have jobs." In Holliday's adopted state, most of the rural population losses are in Eastern Kentucky. He says a possible solution to that is the Saving Our Appalachian Region initiative. "The key question is, how do we build the infrastructure in Kentucky to recruit business and industry to locate in rural areas so that talented and educated individuals can remain in their rural communities and build the future? Hopefully, SOAR will be successful so our local schools and districts can be successful. The alternatives are not very desirable for those communities." Holliday, a native of North Carolina, doesn't use the word "consolidation," but refers to conflicts between Kentucky's county and independent city school systems, and says it's better for local communities to resolve those issues without state involvement. Recently, the Monticello district was absorbed by Wayne County, after the state found that its financial future was poor. A West Virginia Senate committee approved a bill that "would authorize the construction of a state-owned 2,600-mile fiber network that Internet providers could tap into," Eric Eyre reports for The Charleston Gazette. "The companies would still have to build their own fiber lines to customer homes. The new network would cost about $78 million and provide faster Internet speeds and new service to rural parts of the state." West Virginia’s largest Internet provider, Frontier Communications, opposes the bill, Eyre reports: "A Frontier executive told senators Wednesday the project could jeopardize the state’s bond rating and leave taxpayers on the hook. Under the bill, the state Water Development Authority would issue bonds to pay for the 'middle-mile' fiber network that would link rural communities." Frontier said the network would duplicate its own and that of other providers, but Jim Martin, CEO of City Net, an Internet service provider, said Frontier won't let competitors use its network, Eyre reports. UPDATE, Feb. 24: The Ohio oil-and-gas industry gave about $8,000 in campaign funds "to the justice who wrote the pro-industry ruling and $7,200 for another who concurred," the Dispatch reports. Local governments in Ohio can't ban horizontal hydraulic fracturing because the state has "exclusive authority" over oil and gas production, the Ohio Supreme Court ruled 4-3 this week. However, the court left open the question of whether localities can control the location of wells. "As fracking has expanded and encountered spills and fires, several Ohio communities have enacted laws to control drilling. Bans have been passed in Athens, Broadview Heights, Oberlin, Yellow Springs and Mansfield," Randy Ludlow wrotes for The Columbus Dispatch. Athens voters passed the ordinance by referendum in November, with 79 percent supporting it. "At this time it doesn't seem likely that oil and gas companies will seek to conduct drilling activities within the city of Athens," David DeWitt writes for The Athens News, but another DeWitt story reports that surrounding Athens County already gets more out-of-state fracking waste than any other Ohio county, and that a third waste-injection well could make it tops, period. An academic study has confirmed what was reported a year ago, that rural people have fewer choices and higher prices when buying private insurance under the Patient Protection and Affordable Care Act. "Small and rural regions appear to attract fewer entrants. 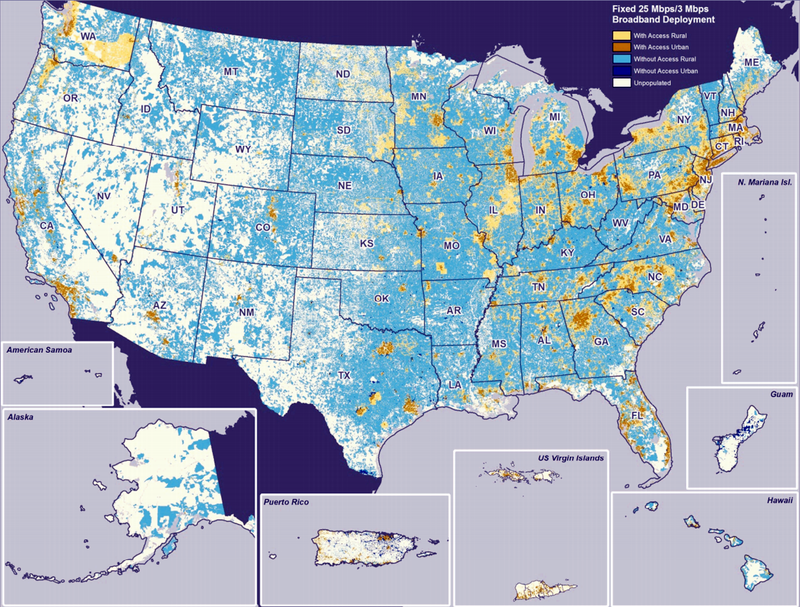 Insurers also charge higher premiums to rural residents," wrote Michael J. Dickstein, an assistant professor of economics at Stanford University, in a brief for the school's Institute for Economic Policy Research. The study looked at the 33 states that use the federal health-care exchange amd did not include those with state-based exchanges, such as the Pacific Coast states, Colorado, Minnesota, Kentucky, New York and Massachusetts. Part of the problem is that many states, in creating regions for insurance companies to set rates, segregated rural areas. "Bundling rural counties with larger, urban areas appears to increase the supply of plans available to rural residents," a Stanford news release says. With many rural hospitals in financial trouble, rural news media need to cover their activities. Some handle hospitals with kid gloves, because they are such important local institutions, often run by well-regarded local people. But in many cases the accountability for these institutions is fuzzy, and rural news media are in a position to increase accountability. One newspaper doing that, and sometimes extending the benefit of the doubt, is The Syracuse Journal in western Kansas, where the latest story is about the administrator of Hamilton County Hospital being relieved of his duties pending an investigation. Administrator Bryan Coffey had blamed "negative" press for his inability to recruit doctors and other health-care providers. In response to that, Journal Editor-Publisher Marcus Ashlock published a front-page editorial headlined, "The truth is a difficult pill to swallow." 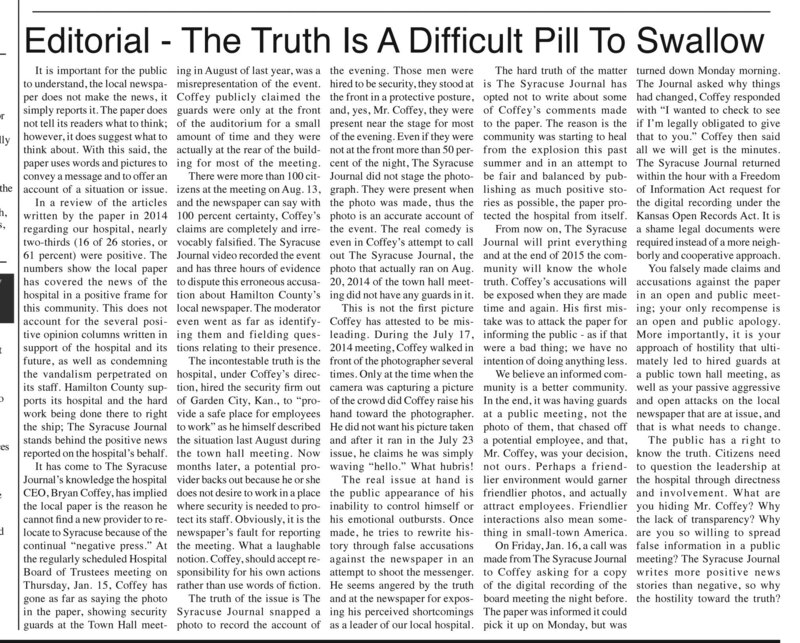 He wrote that in 2014, 16 of the 26 stories about the hospital were positive, not counting "several positive opinion columns written in support of the hospital and its future," and showed how Coffey had "falsified" claims that the newspaper had misrepresented the presence of security guards at a town meeting about the hospital last summer. "The real issue at hand is his inability to control himself or his emotional outbursts," Ashlock wrote. "Once made, he tries to rewrite history through false accusations against the newspaper in an attempt to shoot the messenger. He seems angered by the truth and at the newspaper for exposing his perceived shortcomings." In fact, Ashlock continued, he didn't publish some of Coffey's comments because "the community was starting to heal from the explosion this past summer. . . . From now on, The Syracuse Journal will print everything, and at the end of 2015, the community will know the whole truth." For a PDF of the Journal's front page, click here. If readers of The Rural Blog have other examples, good or bad, of local coverage of rural hospitals' troubles, please send it our way. Around 2.8 million American workers drive trucks, Nutting writes. But more than 21 million work in office and administrative support, more than 14 million work in sales, more than 11 million work in food service and nine million work in transportation or material-moving occupations. The problem is that the U.S. Bureau of Labor Statistics breaks down each group into sub-groups, such as placing the seven million teachers into 80 different occupations, Nutting writes. At the same time, other occupations, such as retail, are all lumped into the same category, regardless of what they sell. The Ohio Supreme Court ruled by 4 to 3 vote on Tuesday that "cities and counties can neither ban nor regulate fracking through zoning laws or other restrictions," Lindsay Abrams reports for Salon. "The controversial 4-3 decision centered around the case of Munroe Falls, a suburb of Akron, which in 2011 attempted to use its home rule powers to block a state-granted drilling permit. Other cities, including Athens, Oberlin and Mansfield, passed similar ordinances, now rendered ineffective by the court’s decision." The justices ruled that Ohio "has 'exclusive authority' and that cities and counties can neither ban nor regulate fracking through zoning laws or other restrictions," Randy Ludlow reports for The Columbus Dispatch. "Justice Terrence O’Donnell wrote that the court still has not resolved whether local zoning laws can control where wells are drilled as long as there is not a separate permitting process." The ruling states that "state law prohibits local government from exercising powers 'in a manner that discriminates against, unfairly impedes or obstructs oil and gas activities and operations regulated under' Chapter 1509 of the Ohio Revised Code, according to the ruling," reports Crain's Cleveland Business. Dr. Chris Jenkins runs a house-calls-only practice in Walla Walla, Wash. He has "joined a growing number of physicians across the country who are rejecting some aspects of traditional medical groups," Sheila Hager writes for the Union-Bulletin. His "office" is a 2007 Dodge Sprinter van, and his patients pay a monthly subscription fee—$70 per adult and $140 per family. Dr. Chris Jenkins talks with patient Mark Sampson. Jenkins will drive over whenever his patients call, so they don't need to wait or take time off of work or school. Although he doesn't accept insurance, he does tell his patients they should get health insurance or a cost-sharing program in case of emergencies. Many of his clients receive coverage through their employers, but they choose the plan they don't have to pay for that has high deductibles and employ Jenkins as their primary care physician. Patient Mark Sampson said, "I used to work for Yakima Valley Memorial Hospital, so I heard all the complaints from the providers about the time they had to devote to paperwork to get paid for the simplest things," he said. Sampson said he likes the house-calls-only model of care. He said it is very accessible and that he isn't a huge fan of the Affordable Care Act. An increase in agricultural crime is leading another rural farming region to adopt a Farm Watch group to encourage residents to report suspicious behavior. Last year residents in Central Iowa formed a program. Now, residents in rural areas surrounding Lodi, Calif., (Best Places map) say understaffed local law enforcement is forcing them to form their own Farm Watch group, Wes Bowers reports for the Lodi News-Sentinel. Rural resident Christy Newport "said the increase in crime in Lodi’s rural area began with home invasions," Bowers writes. "In recent months, crimes such as mail thefts from roadside communal boxes, farmworkers being robbed at gunpoint and their vehicles burglarized have increased, she said." She told Bowers, “It’s gotten to a point where you can walk out of your home at night and find someone near your farm equipment. Or all of a sudden you come outside to find people stealing copper." The 109-car train, which was carrying North Dakota crude oil to a depot in Yorktown, Va., consisted entirely of CPC 1232 models, CSX said late Monday, Mcallister writes. "The CPC 1232 is the newer, supposedly tougher version of the DOT-111 car manufactured before 2011." Earlier this month DOT "sent a package of new rules to the White House Office of Management and Budget for review, but it will be three months before the rules take effect and even longer before the sturdier tank cars will be built," Curtis Tate reports for McClatchy Newspapers. "If there are no other delays, it will be October at the earliest before the newer cars will go into production. And depending on how much time the department gives the industry, it could be several years before the existing tank car fleet is retired or updated to meet the new requirements." "To counter a 'super weed' epidemic plaguing farmers, agribusiness giant Monsanto is steadily moving forward on the introduction of its next major wave of genetically engineered crops," Robert Holly reports for the Midwest Center for Investigative Reporting. Critics concerned about the environmental and sustainability "argue that step forward is actually a substantial leap back." "Propelled by recent U.S. Department of Agriculture deregulation," Monsanto is preparing to market soybean and cotton seeds that will produce plants immune to dicamba, "an infrequently used herbicide that weeds have not caught up with yet" in developing resistance to herbicides, Holly writes. 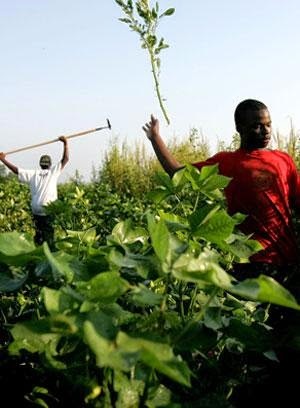 USDA's Animal and Plant Health Inspection Service "determined in its impact statement that the deregulation of new genetically engineered crops would likely result in an increased development of weeds resistant to dicamba," Holly reports. "The agency found that the soybean and cotton do not pose a direct plant pest risk alone, but that their overuse would repeat the same problem that happened with glyphosate and the early Roundup Ready crops," which led to the development of weeds resistant to Roundup, Monsanto's brand name for glyphosate. "But since it is tasked with identifying direct plant pests and not indirect consequences, the agency settled on deregulation." Almost half of rural school districts have no high-school students in Advanced Placement courses that prepare students for college and can even earn them college credit, says a study by the Carsey School of Public Policy at the University of New Hampshire. Researchers Douglas Gagnon and Marybeth Mattingly found that 47.2 percent of rural districts have no students in AP courses, far above the percentages in town (20), suburban (5.4) and urban (2.6) districts. 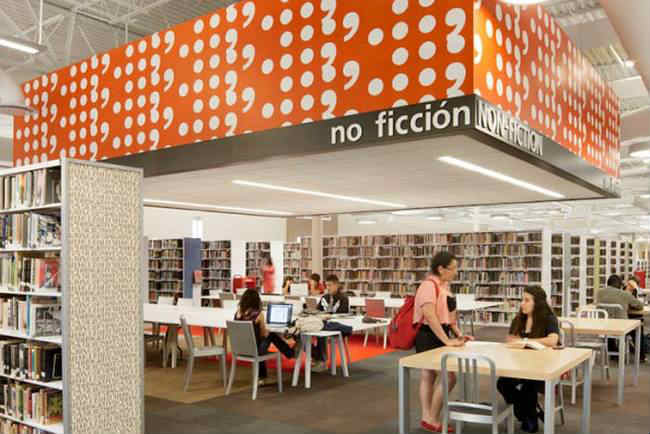 They also found less access to AP courses in smaller districts and those "farther from urbanized areas," their study brief says. In some cases, students in a district without AP courses will take one or more in another district; their districts were counted as having access to the courses. A train carrying crude oil from North Dakota to a Virginia refinery derailed in West Virginia on Monday, creating a spectacular fire and sending at least one car into the Kanawha River. "Last year, a train taking the same route derailed, causing an explosion in Lynchburg, Va," notes Rusty Marks of The Charleston Gazette. 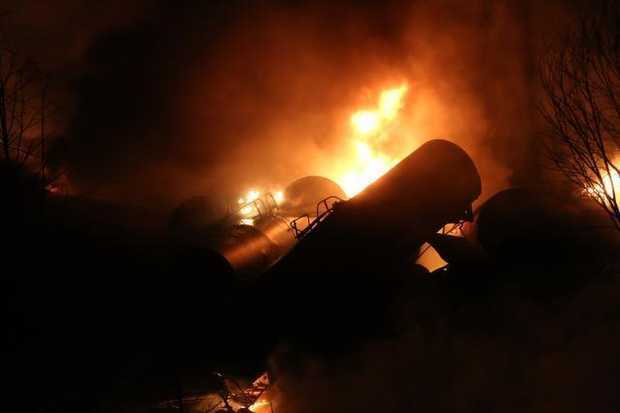 "On Saturday, at least seven rail cars caught fire in northern Ontario after a crude oil train on its way from Alberta to eastern Canada derailed." 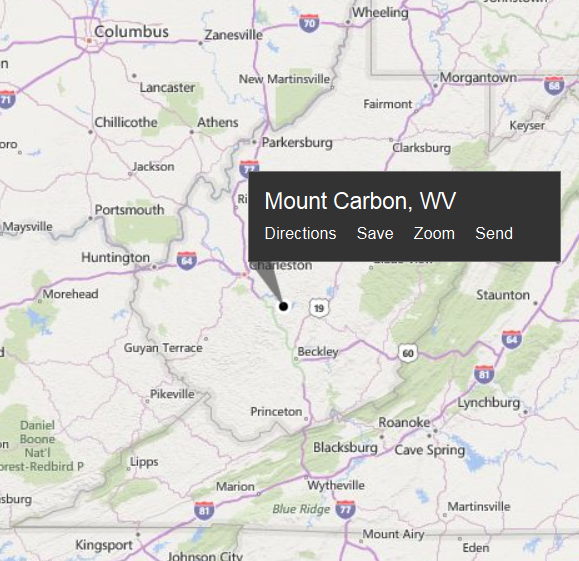 Twenty-five of the CSX Corp. train's 109 cars, each carrying 33,000 gallons of crude, left the tracks in Mount Carbon (Bing map). Some exploded, 14 were reported burning, and the heat was felt half a mile away. One slammed into a house and incinerated it. "No one was reported killed, but CSX reported that one person was treated for an inhalation injury," Marks reports. Downstream communities closed their water intakes, and Gov. Earl Ray Tomblin declared a state of emergency. CSX said it was investigating the cause. Even before the incident, Curtis Tate of McClatchy Newspapers wrote that the Ontario derailment could put "pressure on the White House to accelerate its review of new regulations intended to improve the safety of hazardous rail shipments throughout North America." Tate concluded, "Earlier this month, the U.S. Department of Transportation sent a package of new oil train safety rules to the White House Office of Management and Budget for review. According to the department’s February report on significant rulemakings, it will be another three months before the rule is published. The regulation is expected to call for stronger tank cars to transport the oil, as well as operational changes that could include train speeds and braking systems. But it would be October at the earliest before railcar manufacturers would begin building tank cars to the new standard, and at least two years beyond that before the least protected cars would be phased out of transporting the most hazardous materials." Last summer, the Department of Veterans Affairs said it would offer a "choice card" allowing "veterans who have been waiting more than 30 days for appointments or who live more than 40 miles from a VA facility the chance to see a private doctor," Emily Wax-Thibodeaux writes for The Washington Post. "Some veterans say that when they attempted to use their card, the VA told them they had to live more than 40 'miles in a straight line, or as the crow flies,' from their VA rather than Google maps miles, which makes the card harder to use." Rep. Tim Huelskamp, R-Kan., has filed a bill to use actual driving distances and apply "directly to the type of care requested by the veteran – which means having a Community-Based Outpatient Clinic in the area would no longer prevent a veteran from choosing care at a local hospital if the local CBOC can’t provide the necessary service," the Post reports. "Another problem that veterans pointed to is that all veterans, whether eligible or not, get the card," the Post reports. "Some are showing up in private emergency rooms and try to use the card only to find out it’s not valid." One reader told the Post that VA sent a card to her stepfather, who died in 2009, "a symbol of an agency still seemingly in disarray." Department of Agriculture officials have improved the federal Conservation Stewardship Program, which offers $100 million to landowners who take steps to conserve soil and other natural resources, but is doing a poor job of telling farmers about it, with a Feb. 27 signup deadline approaching, Bruce Knight writes for Agri-Pulse. USDA's Natural Resources Conservation Service "highlighted some pilot CSP initiatives that focus on providing habitat for at-risk species, such as the sage grouse and the lesser prairie chicken, or focus on conserving water and improving water quality in the Ogalala Aquifer. There is also a longleaf pine conservation effort in Southern states," Knight reports. "Those are the ones the agency is talking about because of its political priorities. But what excites me are the enhancements that embrace modern precision agriculture technology, soil health, cover crops and fertilizer management, which are much improved." "The changes NRCS has made are definitely a step in the right direction, and I'd like to be sure that everyone knows about them," Knight writes. "It's almost like NRCS is trying to keep this signup and all its improvements a secret. As a farmer, if you have looked at CSP in the past and found it inflexible or a poor match for your needs, this may be the time to give it a new look. With tough grain prices on the horizon, CSP payments could be what it takes to keep cover crops and other conservation innovations in your rotation." Drone aircraft could weigh no more than 55 pounds, fly no faster than 100 mph and go no higher than 500 feet above the ground, under draft rules issued by the Federal Aviation Administration. The FAA rules would also ban the use of drones near airports and and night, and require their operators to have a special certification and keep the drone "in line of sight" at all times, NPR reports. 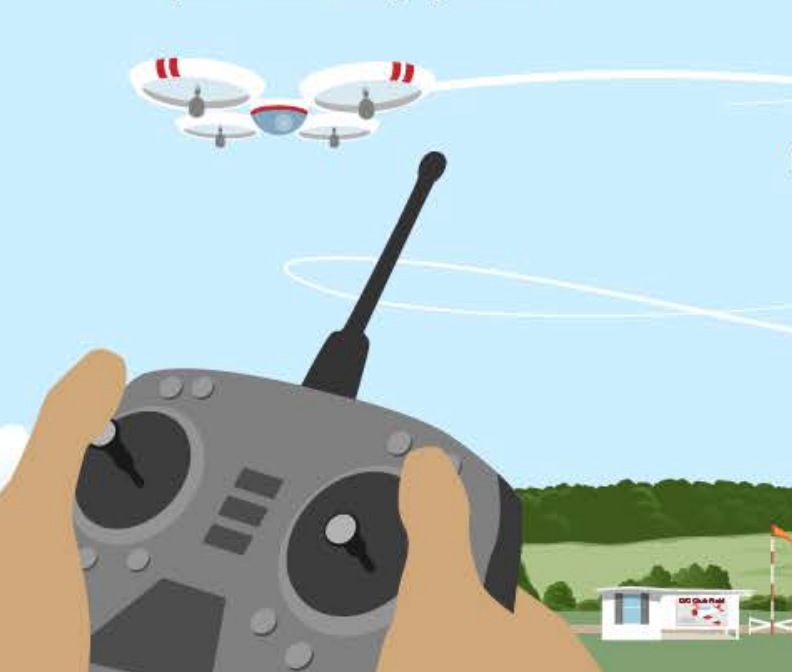 The White House press office called drones "a potentially transformative technology in diverse fields such as agriculture, law enforcement, coastal security, military training, search and rescue, first responder medical support, critical infrastructure inspection, and many others." Presudent Obama issued "a presidential directive that will require federal agencies for the first time to publicly disclose where they fly drones in the United States and what they do with the torrents of data collected from aerial surveillance," Craig Whitlock of The Washington Post reports. Neema Singh Guliani of the American Civil Liberties Union said the regulation is "an important step in restricting how the government uses this powerful surveillance technology" but "falls short of fully protecting the privacy of Americans" because it "allows the use of data gathered by domestic drones for any 'authorized purpose,' which is not defined, leaving the door open to inappropriate drone use by federal agencies." "The unexpected release followed the inadvertent posting on the FAA’s website of a document analyzing the draft rules, which the agency failed to take down before drone enthusiasts found it and circulated it," Larry Downes of Georgetown University writes for the Post. "The final rules still could be two or three years away," Fox News reports, because the draft must be approved by the White House and undergo "a public comment period, and tens of thousands of comments are anticipated. . . . The FAA currently bans all commercial drone flights except for those by a small number of companies that have been granted waivers. Congress has been leaning on the agency to move faster on regulations that would allow a wide variety of companies to employ drones. Under a law passed in 2012, the FAA was to issue final regulations by September 2015, but that appears unlikely." In our opinion, one of the most important speeches given by a public official in the law few years was the address last week by FBI Director James Comey, acknowledging that U.S. law enforcement has a history of being "often brutally unfair to disfavored groups," especially racial and ethnic minorities. 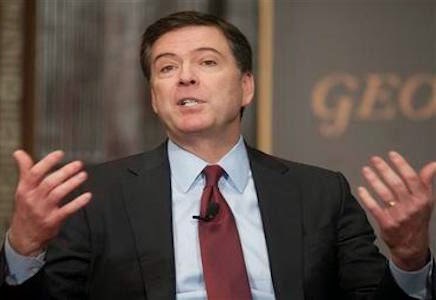 “Many people in our white-majority culture have unconscious racial biases and react differently to a white face than a black face,” Comey said, in a rare case of power speaking truth to power. This is a matter of concern not just in urban areas, where minority populations are relatively larger, but in rural areas, where the percentage of "disfavored groups" can vary widely and the policing is often not as sophisticated as that in urban areas. Perhaps the latest example of that is the rough treatment a man from India who couldn't speak English received from police in Madison, Ala., last week. They threw him to the ground and he was partially paralyzed, reported Challen Stephens of The Huntsville Times. His prognosis is optimistic, NBC News reports. Anna Claire Vollers of the Times reports that more than $170,000 has been raised through crowdfunding to help pay his medical expenses. Her story includes a video of the incident. The assaulting officer has been fired and arrested, Edward Bowser of the Times reports. Given such incidents as this, and the choking death of Staten Island resident Eric Garner at the hands of New York police last year, it was important that the nation's top cop make a speech about police and race. As Washington Post columnist E.J. Dionne wrote, if President Obama or Attorney General Eric Holder, who is also African American, "had given the same speech (and they’ve said many of these things), the response would have been political and in some cases nasty. This only underscores why it was essential for the words to come from a white director of the FBI." "The U.S. drilling frenzy is over. What’s not is the boom in oil production," Asjylyn Loder reports for Bloomberg News. "While companies have idled 151 rigs in five shale formations since reaching a peak of 1,157 in October, they’ll need to park another 200 for growth to stall, according to data from the U.S. Energy Information Administration." "The industry has become better at blasting crude out of deep underground layers of rock, according to productivity data tracked by the EIA in the major shale prospects including the Bakken, Eagle Ford, Niobrara, Permian and Utica," Loder reports. "The improvements have helped overcome the natural depletion of existing wells. Shale wells decline sharply at first and then trail off at a slower rate until they run dry." Loder explains: "As drillers cut costs, the less efficient equipment is idled first while the best machinery is dispatched to the most promising acreage, which boosts the amount of crude produced for every rig in the field. At the same time, the existing pool of wells grows older," so the rate of decline in production shows down. "Just north of Iliamna Lake in southwestern Alaska is an empty expanse of marsh and shrub that conceals one of the world’s great buried fortunes: A mile-thick layer of virgin ore said to contain at least 6.7 million pounds — or $120 billion worth — of gold. As fate would have it, a second treasure sits precisely atop the first: the spawning ground for the planet’s biggest runs of sockeye salmon, the lifeline of a fishery that generates $500 million a year," writes Joby Warrick of The Washington Post. "Between the two is the Obama administration, which has all but decided that only one of the treasures can be brought to market. How the White House came to side with fish over gold is a complex tale that involves millionaire activists, Alaska Natives, lawsuits and one politically explosive question: Can the federal government say no to a property owner before he has a chance to explain what he wants to do?" 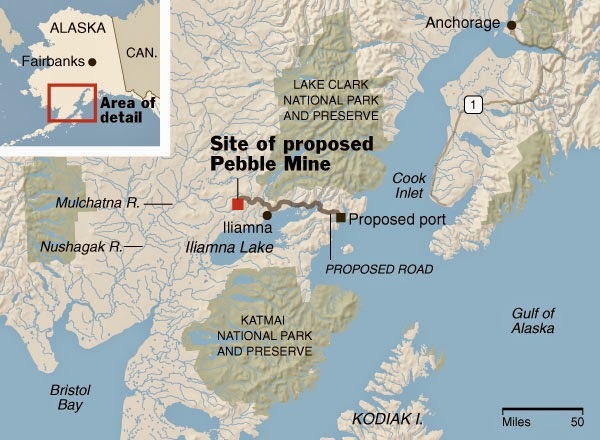 Warrick explains: "As early as this spring, the Environmental Protection Agency is expected to invoke a rarely used legal authority to bar a Canadian company, Northern Dynasty Minerals Ltd., from beginning work on its proposed Pebble Mine, citing risks to salmon and to Alaska’s pristine Bristol Bay, 150 miles downstream. The EPA’s position is supported by a broad coalition of conservationists, fishermen and tribal groups — and, most opinion polls show, by a majority of Alaskans.